Okay. . .we know we’re going to regret writing this, but given the last few days, it’s something that we have to talk about. You can see it in everyone’s faces. The students at Texas State–they know what’s happening. The cafe’s on the square–they know what’s going on. The smiles on people’s faces say all that needs to be said. Yep, we’re experiencing spring before winter. A run of days in the 70’s has most of the town giddy with excitement. Why not? Normally, we’re excited to be in the 50’s or 60’s this time of year, but to be in the 70’s (closer to 80) in late January puts a spring in just about everyone’s step. Without gloating (although we’re good at it) we talked with daughter #2 in Boston and it was 9 there yesterday. Yeah, as in 9 above zero. As in, it’s too cold to snow. Factor in the wind chill and you’re talking downright nasty. Oh, but don’t worry–most of the midwest, south and northeast are in the Big Chill. How long it lasts is anyone’s guess, but having spent a fair number of winters in St. Louis, we can tell you that some years are just plain worse than others. We still remember January of 1990. . .we were living in a rent house in St. Peters, Missouri–just outside of St. Louis County. Early in the month we had a pretty significant amount of snow which was followed by several bouts of freezing rain, and the last piece of the puzzle was frigid temperatures. The bottom line that year was we never could shovel the driveway or walkway because everything was frozen–solid. And, just like up in the Boston area today, the wind chills were brutal. . .at one point, 35 below wind chill factors. Not the stuff we were used to. Since we don’t have a wine from where it’s really, really cold. We decided to head up to Washington for tonight’s selection. 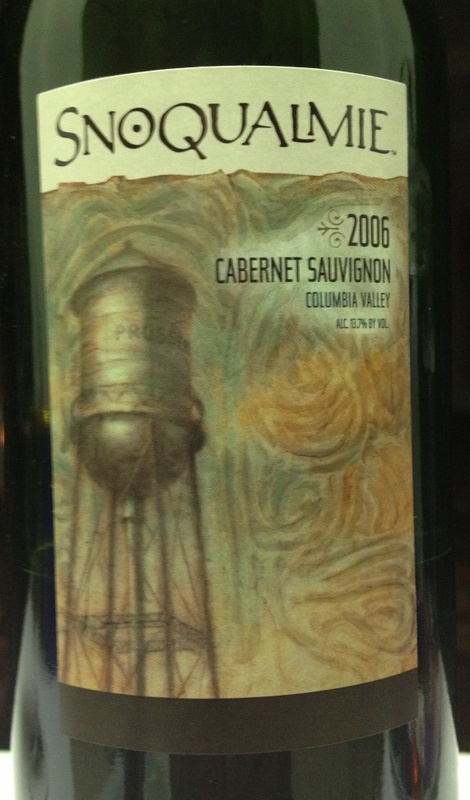 Our 2006 Snoqualmie Cabernet Sauvignon from Columbia Valley was a surprise and a treat. This was a Twin Liquors find and if memory serves us, it was less than $12 a bottle. According to their website, “Founded in 1983, Snoqualmie was one of Washington’s first premium wineries, producing classic wine varietals from vineyards across the Columbia Valley. Originally located in the foothills of the Cascade Mountains, Snoqualmie opened its winery in Prosser, WA, at the base of the Horse Heaven Hills, in 2002. Under the leadership of Joy Andersen, winemaker since 1991, Snoqualmie has become a leader in sustainable and organic wine making in Washington.” What we like about it was the taste. Yes, it had a classic Washington State Cabernet nose. . .picked up a lot of blackberries and black cherries. But the taste–a real subtle earthiness to it which was enhanced by the smooth tannins. Clearly, it’s aged well in the bottle and as a perfect accompaniment to grilled steak and a baked potato, this wine is now a favorite. We’re also of the opinion that it could be a perfect deck wine. . .which we can enjoy because the weather is perfect for deck-time! We know that at some point winter will come back to this part of the state. It always does. Two years ago, before moving to San Marcos, we still remember the weekend that we brought furniture up to Brian’s apartment–it was in the low 80’s and very sunny and warm. By the end of the day on February 1st, the temperatures were in the 20’s where they’d stay for the better part of the month of February. You never know what kind of winter is going to be thrown at you, so it’s nice when we can sit back, pour a glass of wine and enjoy it OUTSIDE this time of year. As you enjoy your favorite wine (try the Snoqualmie) please remember to enjoy it responsibly and recycle whenever possible. Categories: Uncategorized | Tags: Boston, Missouri, San Marcos, Snoqualmie, St. Louis, St. Peters, Texas State, Twin Liquors | Permalink.